These Artists Were Brought to You By the Letter "C"
My father was a high school biology teacher whose curiosity had no limits. As children, my sister and I were always urged to "Go look it up" whenever we had a question. It didn't matter what the question was or how complicated the subject, he helped us develop a life-long thirst for discovering new information and seeking out more. 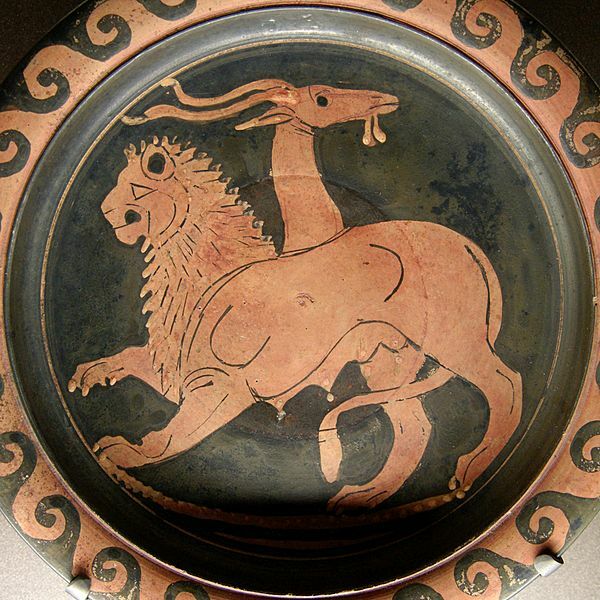 The Chimera was, according to Greek mythology, a monstrous fire-breathing female and male creature of Lycia in Asia Minor, composed of the parts of three animals: a lion, a snake, and a goat. Usually depicted as a lion, with the head of a goat arising from its back, and a tail that ended in a snake's head, the Chimera was one of the offspring of Typhon and Echidna and a sibling of such monsters as Cerberus and the Lernaean Hydra. The term chimera has come to describe any mythical or fictional animal with parts taken from various animals, or to describe anything perceived as wildly imaginative or implausible. Chameleons are a distinctive and highly specialized clade of lizards. The approximately 160 species of chameleon come in a range of colors including pink, blue, red, orange, turquoise, yellow, and green. They are distinguished by their zygodactylous feet; their separately mobile, stereoscopic eyes; their very long, highly modified, rapidly extrudable tongues; their swaying gait; and crests or horns on their distinctively shaped heads. Some chameleon species are able to change their skin coloration. Different chameleon species are able to vary their coloration and pattern through combinations of pink, blue, red, orange, green, black, brown, light blue, yellow, turquoise, and purple. Color change in chameleons has functions in social signaling and in reactions to temperature and other conditions, as well as in camouflage. The relative importance of these functions varies with the circumstances, as well as the species. 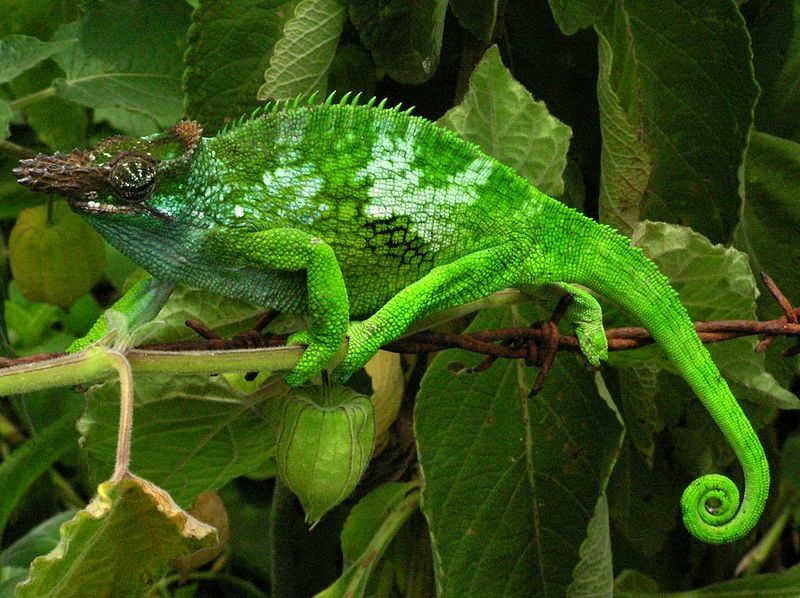 Color change signals a chameleon's physiological condition and intentions to other chameleons. Chameleons tend to show darker colors when angered, or attempting to scare or intimidate others, while males show lighter, multicolored patterns when courting females. Some species, such as Smith's dwarf chameleon, adjust their colors for camouflage in accordance with the vision of the specific predator species (bird or snake) by which they are being threatened. 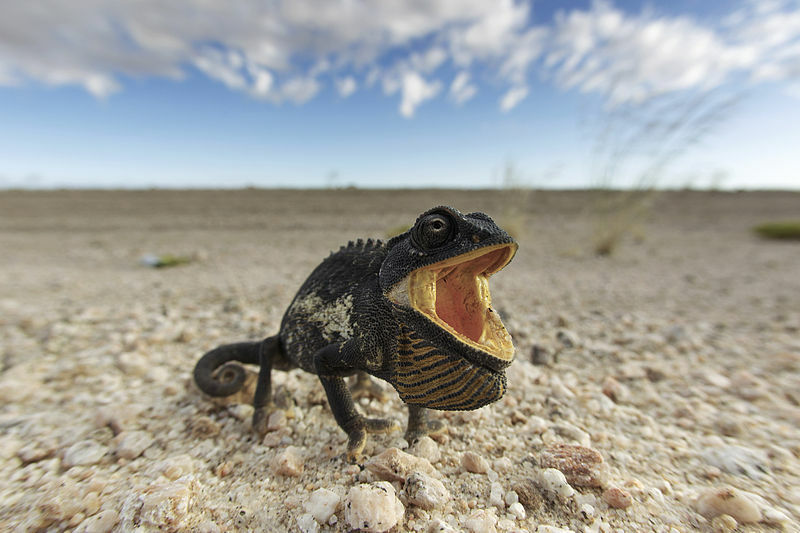 The desert-dwelling Namaqua chameleon also uses color change as an aid to thermoregulation, becoming black in the cooler morning to absorb heat more efficiently, then a lighter grey color to reflect light during the heat of the day. It may show both colors at the same time, neatly separated left from right by the spine. Mika Mattila's often perplexing documentary, Chimeras, asks if the search for a national cultural aesthetic (so vividly expressed during China's Cultural Revolution) has been abandoned for opportunities to cash in on fame and celebrity in Western markets. 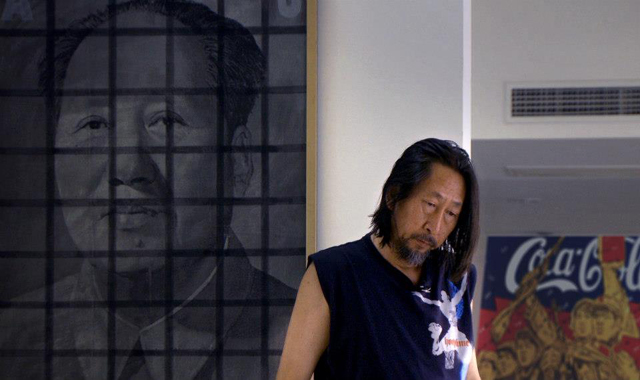 As he looks at some of the art emerging from one of the world's most rapidly changing societies, he focuses on two highly acclaimed Chinese artists at different stages of their careers. The only child of a rural family, Liu Gang's career as a photographer took off like a rocket when an American curator invited him to exhibit his work in China's most prestigious art gallery. As his fame has grown, he has found himself socializing with Beijing's jet set, living in a world of westernized luxury, attending embassy parties, and considering the promise of a major international career. With more money than he could ever have imagined in his youth, he now finds himself eager to cash in on a wealth of opportunities as he wonders what the future holds in store. Liu Gang and his bride pose for a formal wedding portrait. During the three years of making this film, the Chinese art markets have steadily grown from the third place behind France and the USA into the biggest art market in the world. Yet very few in the West can name a single Chinese artist besides Ai Weiwei. How can it be that we know so little about the modern culture of the biggest country and oldest continuously existing civilization on the planet? And when we do know something, why is it only from the singular perspective of politics (seen largely from the Western perspective in regards to China's political system)? For me, what happens in the Chinese art scene not only encapsulates the underlying currents of Chinese society, but tells us something about the world we are about to enter. For the years that I've made Beijing my hometown, the art community has been my home base. I saw how the art scene could offer a window into Chinese modernity like no other segment in the society quite did. 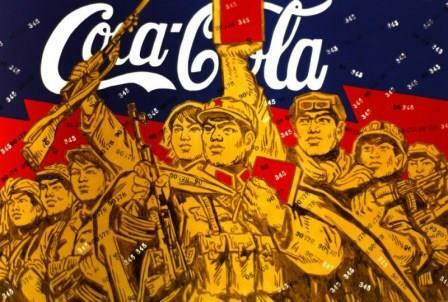 The contemporary art scene is perhaps the clearest segment of modern Chinese culture that is both deeply integrated with the global scene, but also domestically 'free' enough to flourish. There is a precedent for our ignorance that perhaps illustrates the point. When the British Empire tried to reason with the Middle Kingdom, wanting to lure them into relationship with the Europeans, the common understanding in China was that there was nothing of great value in the West. Weapons and some technical gimmicks might be useful but, all in all, the West was deemed a barbaric hinterland, culturally not worth another look. Western culture was seen as an exotic curiosity that would eventually either be drawn into the influence of the Chinese cultural sphere or else vanish back into oblivion. Even if the Europeans clearly possessed plenty of power, they certainly had nothing to offer culturally. It was not considered ignorance if one knew nothing about the West. The Chinese Empire paid dearly for their arrogance, and only after two humiliating centuries is China recovering from their inability to adapt. The same questions still remain relevant within China's cultural discussion: What is useful to adopt from the West? What is useless? Or even worse, what is harmful? Is modern always synonymous with Western? What most worries me is how little of this kind of reflection we do in the West. Perhaps we are where China was a few centuries ago: the dominant culture (ignorant, arrogant and certain of the inevitability of our ways). Even if much of the fuss about the Chinese art boom could be dismissed as a passing trend, I strongly feel that what is happening in the contemporary art scene today is just foreshadowing something more significant and widespread that will follow. Through these artists and their reflections, we can perhaps open a window into a realm of thinking that many of us are not familiar with. A realm that is getting more significant to us by every day as Chinese influence in the world inevitably grows and old ways of seeing are forced into history. 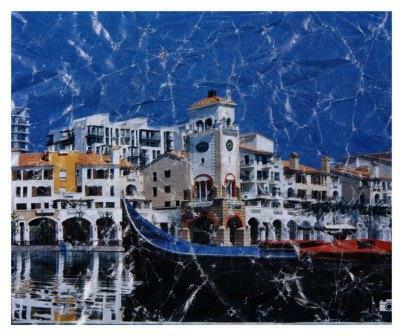 One of Liu Gang's pieces of "crumpled paper" art. Over in San Francisco's Mission District, The Marsh recently presented the world premiere of a one-woman show by Safiya Martinez entitled So You Can Hear Me that has been beautifully directed by David Ford. 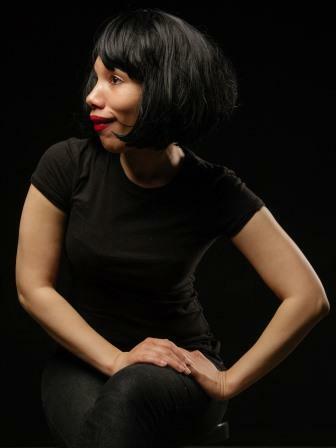 A petite woman who moves with the fluidity of a dancer (like her half Puerto Rican, half Russian Jewish mother) and mimics voices with the deftness of a jazz musician (like her African American father), Martinez drew her material from the special education students she met while teaching in the South Bronx and the Lower East Side of Manhattan. While Martinez may only be five feet tall, her talent as a storyteller is huge. Her nine characters have the kind of expansive personalities which (though they may hunger for love) can fill any public school hallway with their bravado. Though they may be struggling with autism, dyslexia, and multiple sclerosis, like other kids their age they are also being jerked around by their raging hormones. This work interrogates several different issues thematically. At the top of the play, I focus on the transformation of the grittier reality of New York from my childhood during the 1980s to the multitude of issues that arise with present-day gentrification. The current climate within the school system reflects these issues in complex and painful ways. Through this work I explore how safety, aggression, and resistance are negotiated within the space of a school and how the larger economic and political climate of the city informs the lives of students and teachers. So You Can Hear Me is a play about voice, and also works as a love letter to the youth culture that emerges from New York City. Its language speaks with urgency, swagger, vulnerability and, ultimately, an honesty that I dramatize for the stage. The work is an exploration of the universal human desire for love. Through interconnected narratives, each character voices an essential desire to be seen and heard, clearly. Because so many of the characters Martinez has developed for her show are in high school, it's easy for her to switch between male and female voices without having to think about boys whose voices have changed. Some of her students are the kind of prepubescent squirmers whose energy can't be contained. The girls, however, are often wiser, more sophisticated, and in their own way, quite competitive. As a solo performance artist (and a gifted writer), Martinez has done an excellent job of making So You Can Hear Me a lean, trim monologue which never sags or loses focus. She gives the audience plenty, but just enough to keep them wanting more. Here's a glimpse of Martinez as Sammy (one of her most memorable characters).